The Animated Woman: To iPad or not to iPad...that is the Question. I've been toying with the idea of getting an iPad. I mainly want to use it as a portable digital sketch book to create rough drawings for my blog, on the fly. Before I dish out the money the Board of Directors in my head want to know what the drawing apps can do. So I borrowed my mom's iPad, got myself a Wacom stylus and loaded up on apps. As far as duplicating my blog style, which is drawn in Adobe Flash, this is how it panned out so far. I started with Sketchbook Pro - it felt good, though it's not a vector program. I don't mind it too much as a sketchy version of my blog drawings. What do you think? 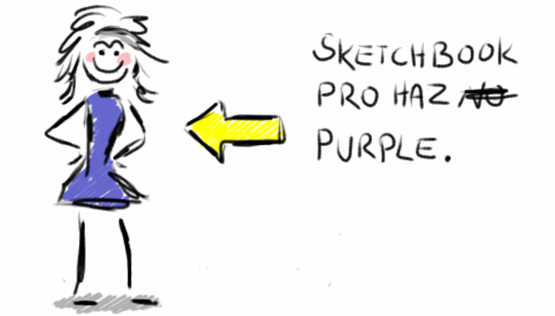 It does have a lot of 'feel'... and I did eventually discover the all-important-purple ha ha. And then I tried a vector program called iDraw. 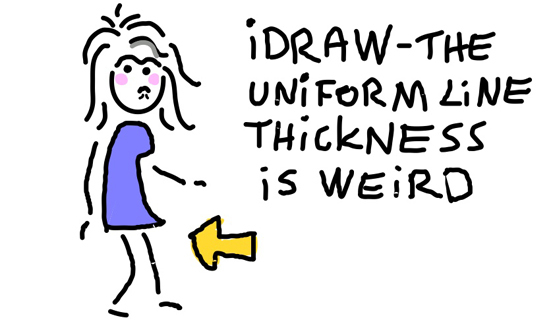 The pencil tool only gives a line with uniform thickness. So I gave the brush tool a shot - it can do thick and thin, but only calligraphy style. I don't like it. I found it difficult to control the select tool in iDraw. 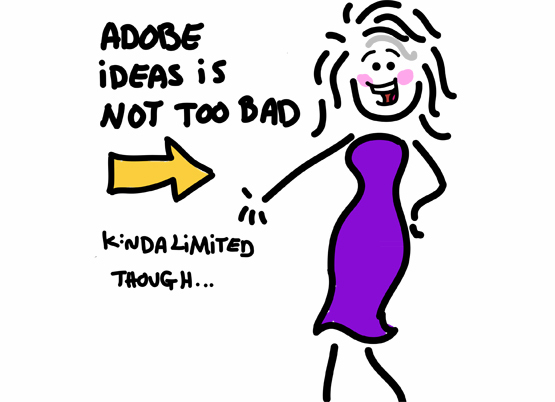 Adobe Ideas was actually cool. It's super simple to use and the brush feels amazing. I think it came closest to the look of my blog style. But it's a little too simple for my needs. There's not nearly enough layers, there's no way to merge layers and there's no way to grab the whole image and move it around. 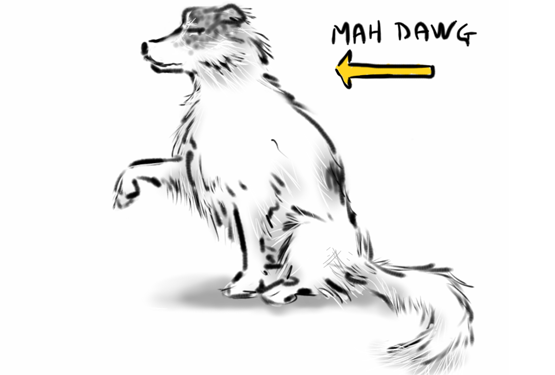 Then I went back to Sketchbook Pro and did this drawing of my dog. Holy crap this thing is fun!!! So what's the verdict - should I spring for an iPad or what? Do you guys think you can handle the occasional post done in a sketchy style? Spring for it. The Moxie has spoken, thus it must be so. (That didn't exactly work out for winning the lottery this past weekend, though...). That lottery unfortunately coincided with April Fool$. Looks like Baby, bit why isn't she staring manically? This is her "disapproving" look. She's mastered a few subtleties since you last saw her. I think they're all pretty fab! I'd totally spring for it. I say you should check out the Android tabs before springing, but I know nothing of drawing. I do love your dog though. I'm checking them out; but the trouble is that I don't know anyone who has one that I can try. I'm hands on - I neeeeeed to feel it before I buy it. EXACTLY. I'm glad you noticed it. While every colour is available, the app doesn't seem to have a precise RGB input function. Not good. I second the recommendation to check out the Android tablets. I know my preference leans towards the Toshiba Thrive. PC World ranks it as a best buy among tablets. I'm checking them out. Wish I knew someone who had one (near here) so I could try it. Do you have one? True. I'll have to keep this locked up or our son will get his mits all over it. I can deal with you being kinda. . .sketchy. Heh. Damn. I'm just jealous cuz you made that joke before I did. The dog portrait is beautiful, and to my uneducated eye, somehow 'more arty' than your usual fabulous drawings! Thanks hon. 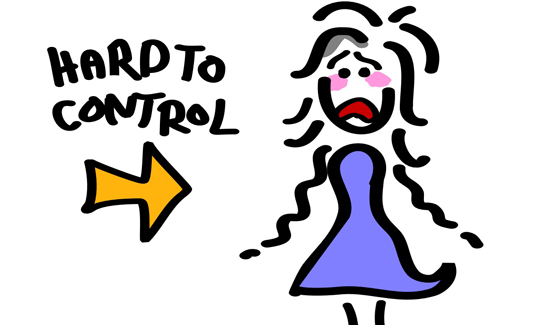 Most people don't realize my blog style (enhance stick figures) is only one of the styles I do. I can do 'arty'. you are making me want one! Seriously? Apple should be giving me this iPad just for making you want one. A stylus would be awesome~! A great artist, like yourself, will make any of those apps sing. Loving the dog drawing! DO IT! Apple SHOULD supply you with one. They'd likely sell a bunch as a result of people seeing the great things you do with it here. And here I thought my DrawSomething pictures using my finger were the bomb. I gotta get me one of those stylus! I vote yes. iPad Love.